See this registry fix if you're facing error 80240020, 80080080, 8024600A, 800703ED etc. while installing Windows 10 using Windows Updates. While upgrading to Windows 10 via Windows Updates, you MAY came around different errors with failure of installing updates. These errors are actually Windows Update errors and the cause for them is mentioned below. Upgrading from Windows 8.1 Update or Windows 7 SP1 is likely to have these errors. Recently, we came around one of these error while upgrading from Windows 8.1 to Windows 10. The error code for failure of Windows 10 installation that we received was 80240020. Go here, if you get Something happened – Windows 10 installation has failed error while upgrading. You may also receive 80080080, 8024600A, 800703ED etc. etc. when you upgrade by installing updates. We recommend you to try the Windows Update Automated Troubleshooter or reset Windows Update components to fix this problem. The reason behind this issue that Windows Update takes its own time to download Windows 10 and notify you when the upgrade is ready. This means that download is neither corrupted nor there is any problem with reservation and Windows will notify you to upgrade when its ready for it. But if you don’t want to wait for automatic installation, you need to edit registry. So still after trying troubleshooter, if the issue persists, we suggest you to take following steps to modify registry configuration, so that the updates install immediately. 4. 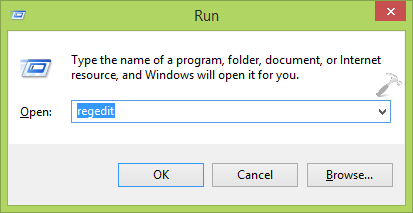 Finally, in the above shown Edit DWORD Value window, set the Value data to 1 and click OK. You can now close Registry Editor and reboot to let Windows Updates installing your Windows 10 upgrade. Hope this helps! Go here to checkout how to make clean install of Windows 10 using ISO file.